I just wanted to share this view from my window this morning. 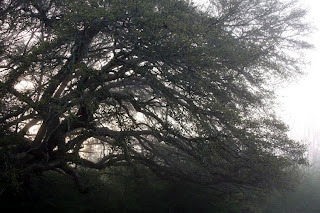 (it's my big, old, oak tree in the fog if you can't tell) I LOVE the wispy, fuzzy, quiet feeling that fog brings. Though, it's not the best way to start the day, as it seems to slow things down (especially traffic.) As such, I wasn't as active as I have been in the mornings lately. So, I took my time to take my shower and get dressed (then rushed outside to snap some pictures) before heading to work. As the fog begins to clear, my head does as well. 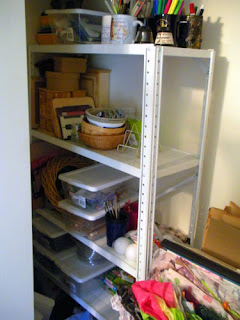 On the craft room front, I was able to accomplish QUITE a bit last night. 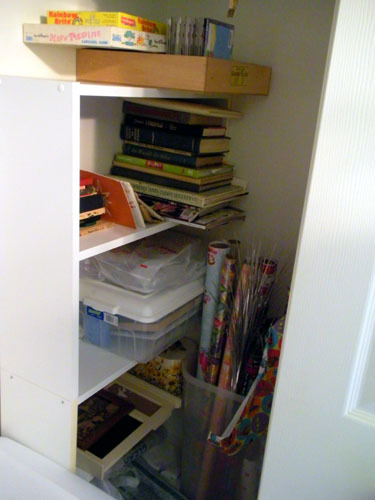 I got the closet done!! (with the exception of the top shelf.) 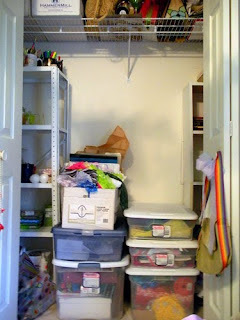 If you didn't see the craft room closet pictures yesterday you should do so now. . .I'll wait. . . Because, here are the pictures of how it looks now. While many of you may not think it's a big difference or even that it's not really THAT tidy. I disagree. It's a HUGE IMPROVEMENT. It no longer scares me. That's a good thing!! What's left is just some miscellaneous stuff scattered on the floor that needs to find a home. It really shouldn't take too long, hopefully. I would love to have the room done by the end of the weekend, but with Easter being Sunday and that being a day of visiting family- I've been skeptical that it would be possible [since Pat and I tend to take at least one day each weekend to spend TOGETHER (me cleaning the craft room does not fall into this category.)] Yet, this morning I realized that we'll be waiting around the house tomorrow for our iPad delivery. . .so I might actually be able to knock it out!! Wouldn't that be WONDERFUL?! A clean, organized, functional CRAFT ROOM!? I can't wait!! National Wildlife Federation's Nature find to help you find outdoor/ nature locations to visit. How fun!! This may night make others feel as good as it makes me feel - but check it out - a world of BEADS!!! So that's all for today. Have a fantastic weekend!! Glad you're back to such faithful blogging! p.s. VERY cool picture of the oak tree. Good work. OMG - where the heck is she shopping? Those had better be some handmade lampwork beads beads she bought or something. The beads will be given away, I don't have the time to deal with selling them or the space to store them - but it is a good idea. They just HAVE TO GO!! one day I am going to get me one of those craft rooms I hear so much about.